There was a lot of questions posted here in the comments as well as e-mails to me about the details of this command center. Ask and you shall receive! Don’t go getting all power crazy though, I had planned to share how I created this. If you have not been following along, this command center can be seen here. It is in a formerly un-usable space in our hallway. 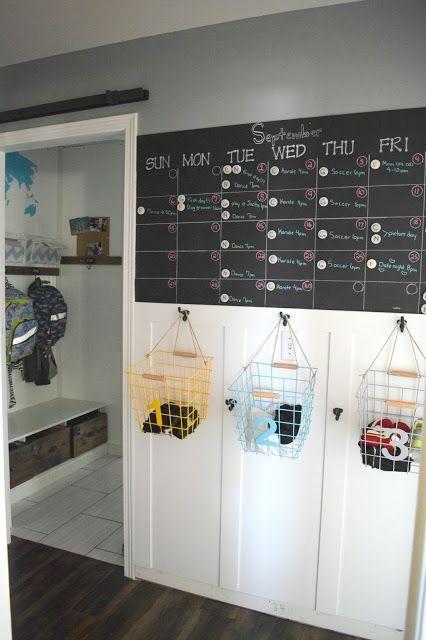 I created this to help control our schedule and the baskets are used to hold my kids extracurricular gear in. To put it simply, I created this because I am a Mom to 3 kids. No more explanation is needed. You can see the complete hallway transformation here, with a ton of before pictures and what this space looked like in each of its phases. This is how the space looked about 5 years ago. This little corner of our home has come a long way. So has our camera and my picture taking skills, unless we all saw in non-HD then. Hmm, makes you wonder? I know when I was little and saw black and white pictures I seriously thought there was no color, that all there was in the world was black and white. Obviously I was a very bright child, the next Einstein….. Here was my first attempt at making this space function. 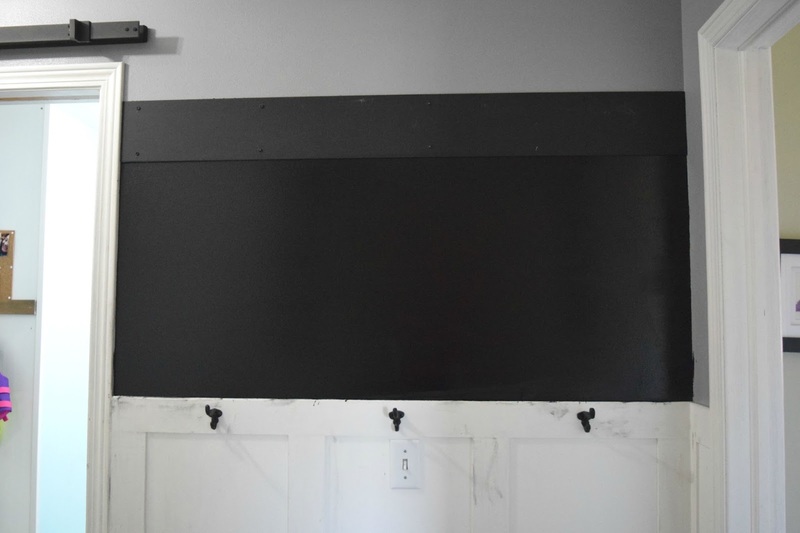 We put up the wainscoting a few years ago, pre-blog. So there is no snazzy pictures to share of that process. I hung some hooks, used chalkboard paint, and a piece of metal was nailed to the top for some magnet action. It was cute, I got to write adorable little sayings to my children, that cannot read yet. You know, to really inspire them and get their day going right. Nora can read now and she often questioned my spelling and punctuation with my messages. I was right, but she prefers to think she knows more than me. Anyways, as you can see it was not functioning too well. Since this space is in the corner by my kids bedrooms this space will always remain un-usable. Until now! Now, time to make this work for me, my kids, Dale, Pinterest, our schedule, the dogs… it just works. A command center is what we need. 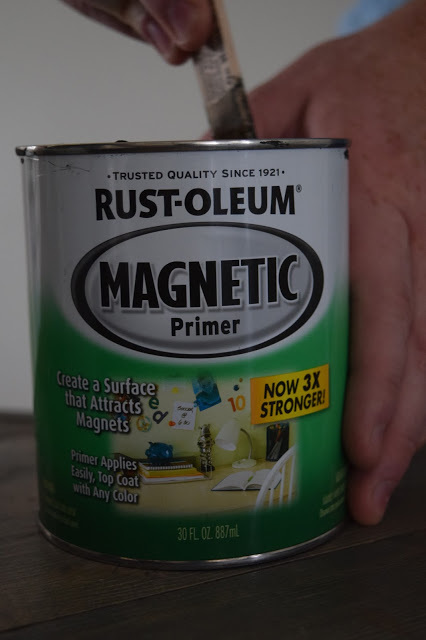 I purchased this magnetic paint. I have never used this before, so it was a learning process for me too. When I shook it, as the directions said, the paint looked like this. Really clumpy. I thought maybe that is how it is supposed to be. Just to let you know, this is not how magnet paint should look. You have to shake it, shake it like a Polaroid picture. Then shake some more. I finally stirred it. 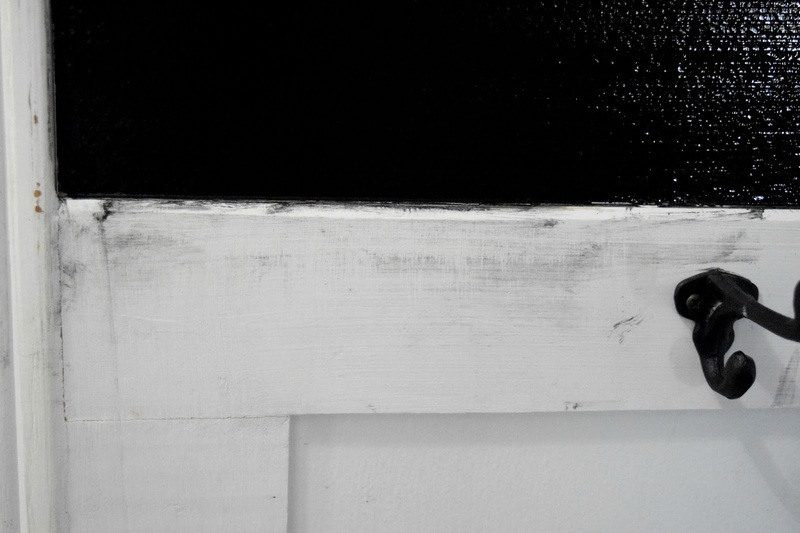 The clumpiness went away and the consistency was similar to normal paint, a little thicker version of paint. I used a brush and put it directly onto the surface. 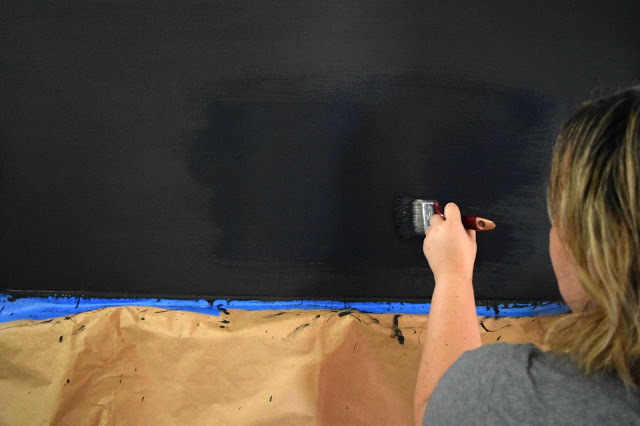 With us having already painted this area with chalkboard paint about two years ago it can be hard to see what I did. I went from side to side, trying not to have any clumps. That creepy claw arm is mine. This picture proves that when in doubt, have Dale take some wide shots. My whole body would have looked much better then this monster hand thing that is doing the painting. Whoops. See, here is where I got ahead of myself. I know how to paint, I am a pro painter. I rarely tape up my area I am painting. I have gotten that sure of myself. I need to remember that the universe has a way of knocking you down a peg or two. 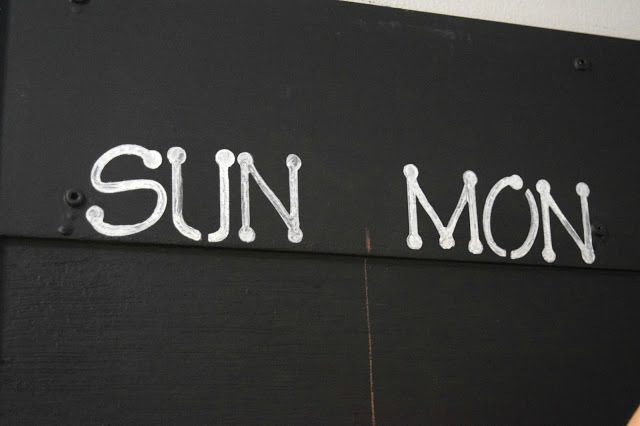 Thinking I had this, with me never using magnet paint before. I still decided I did not need to tape anything up. I was so, SO wrong! There was paint and splatters everywhere. I wiped away what I could quick enough. But, the walls and wainscoting needed to all be sanded down and repainted after we were done with this command center. 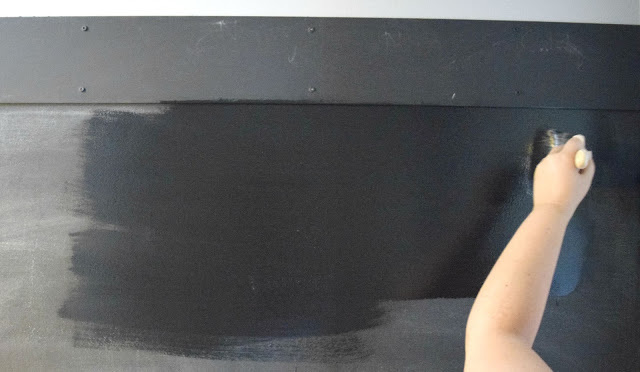 Prep your work space before you paint!!! Unless you enjoy sanding (blah) and repainting perfectly good trim and walls. 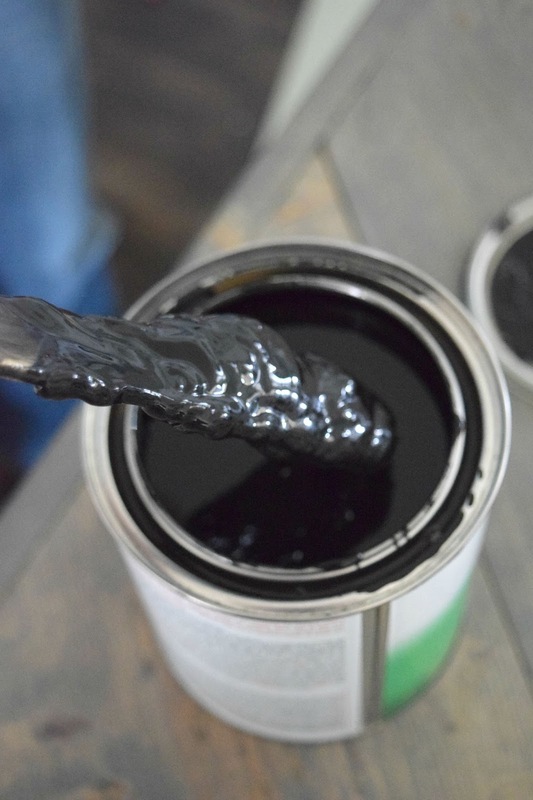 This is how the magnet paint looked after three coats. I put the coats on thin, so that there would be enough coverage but no lumps and bumps in the surface. This is how your hands look when not wearing gloves, because I am a pro painter…. this took a good week to come off. Who knew magnet paint was not like standard paint? I do now! Are you ready for this really simple secret to customize these? I used a sharpie and put the first letter of my kids name. A sharpie! See, this is a no fuss way of making a command center. 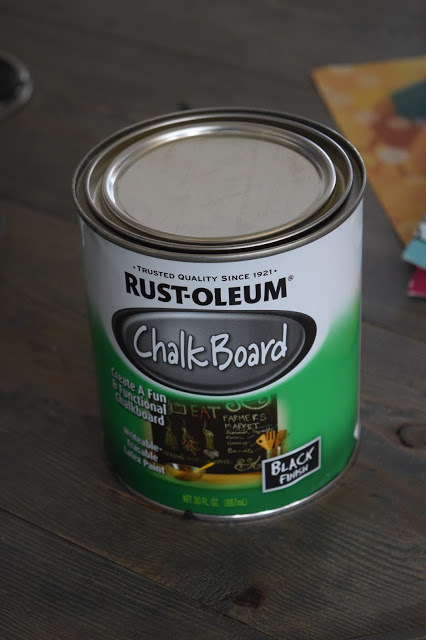 I know chalkboard paint, I got this one. It goes on much smoother and easier then the magnet paint did. 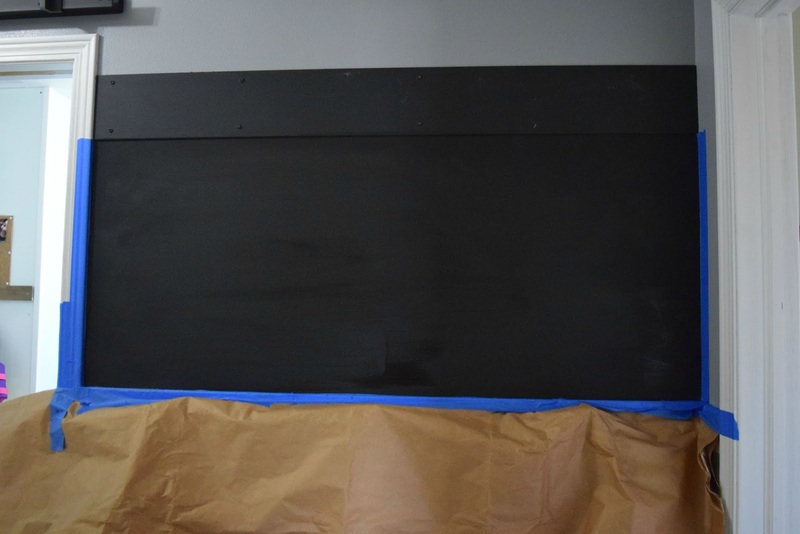 As you can see from the above picture that the chalkboard paint is much thinner. I went side to side just as I would with any paint. 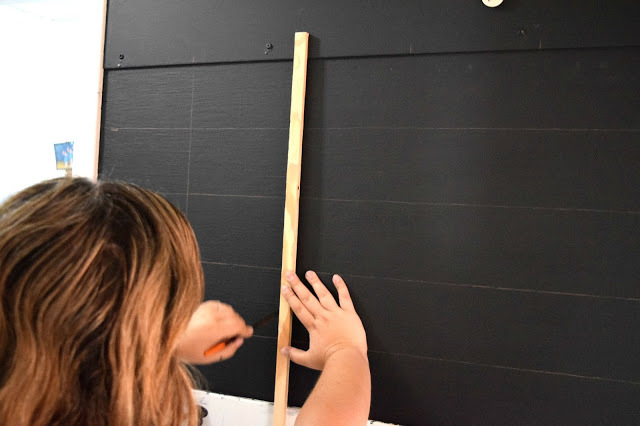 I did two coats of the chalkboard paint, and of course had to test out the magnetic pull of the paint with the magnet clips. Score, they stuck! Now it is time to make some lines and turn this into a full on command center schedule. I will not break down the sizing I used, because each home is going to be so different with the space you have. I don’t want someone to get stuck on the exact measurements. The process and steps I am sharing can be used with any size command center. 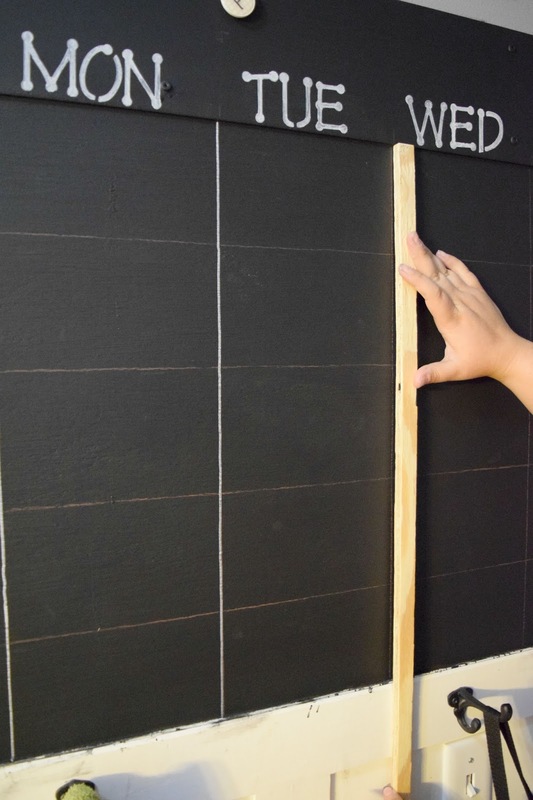 I measured the length of the wall. Then divided that by 7, which is how many days are in the week. I needed to make enough even spaces to have the days of the week listed in the top part of this wall. 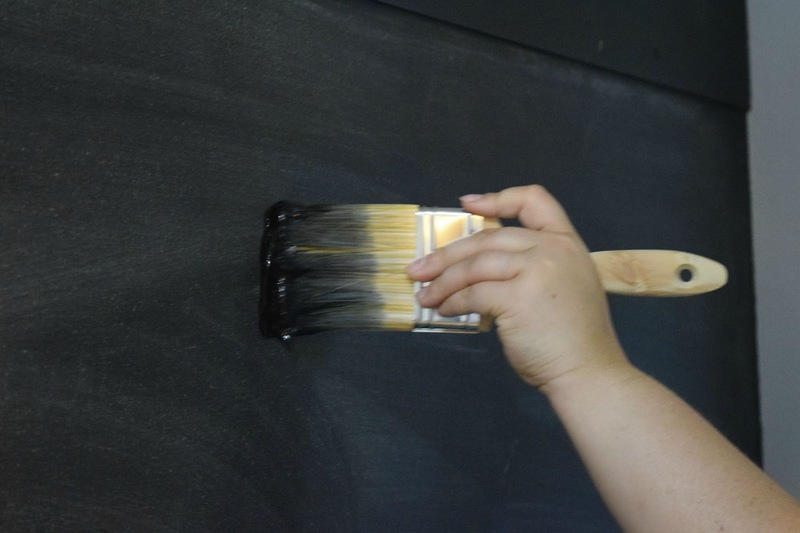 I used a chalkboard colored pencil to make these marks. It was subtle and erasable. I measured the height of the space, and divided that by 5. This is how most calender’s are set up and allows the number dates of the month to be added and changed. I used a spare scrap of wood that was long enough to run along the chalkboard. Then traced the lines from my measured marks on the wall. Giving me as clean and straight of lines as possible. 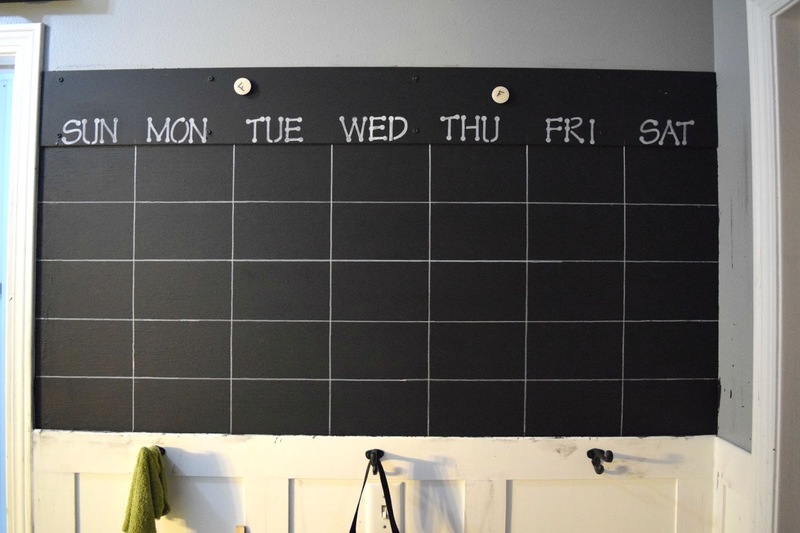 I used a permanent chalkboard marker to make the lines and the days of the week. You can find the one I used here (contains a affiliate link). 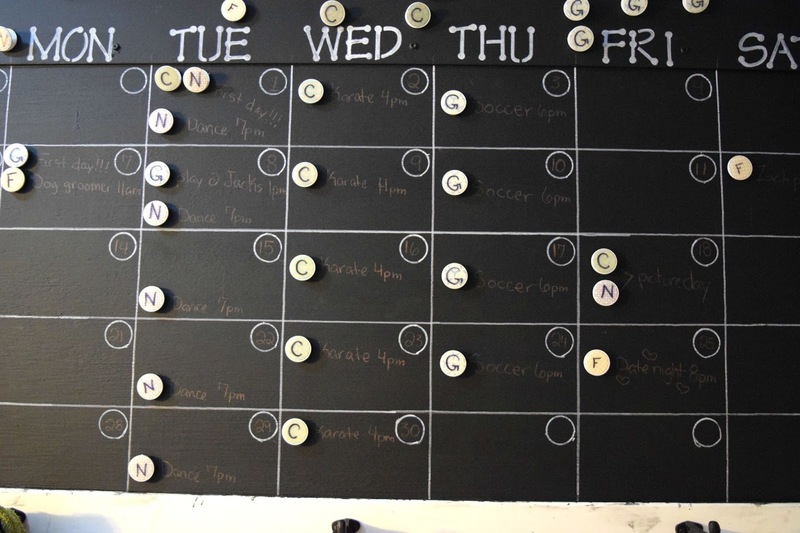 I used a standard stencil and the permanent chalkboard marker to draw the days of the week. 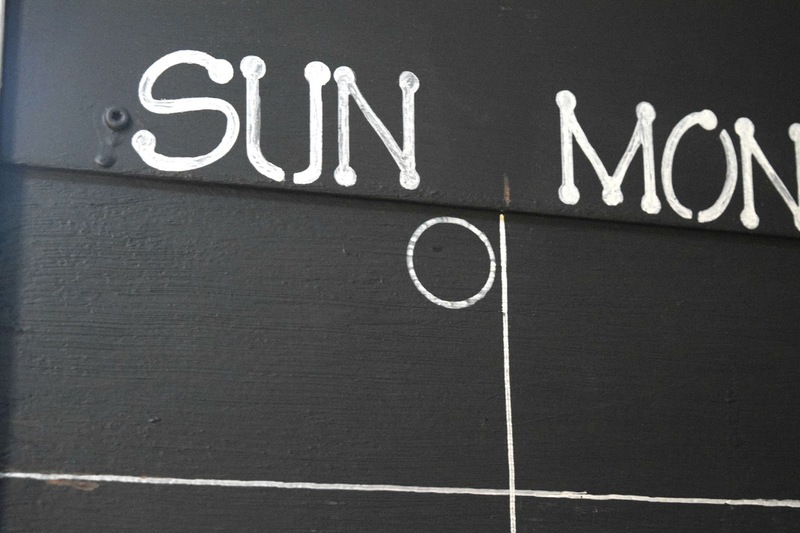 Once I knew I was happy with the placement of the lines and the days of the week. 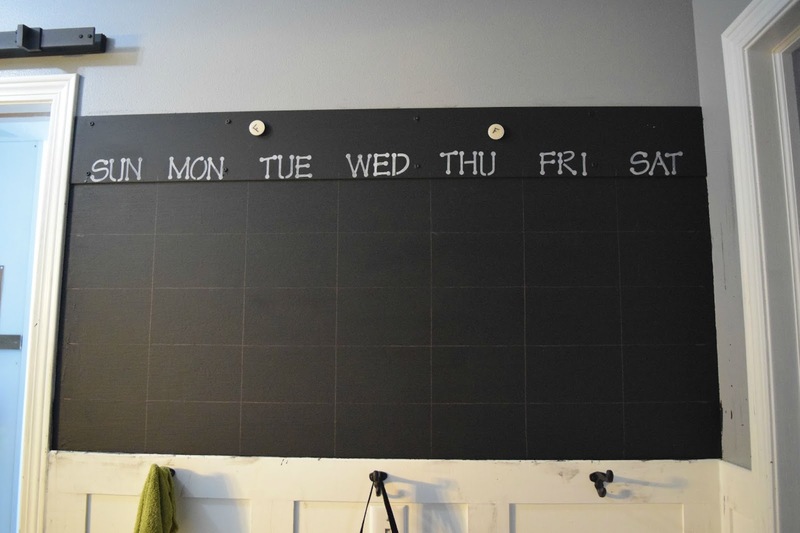 Using the same permanent chalkboard marker to make the lines of the calendar permanent. 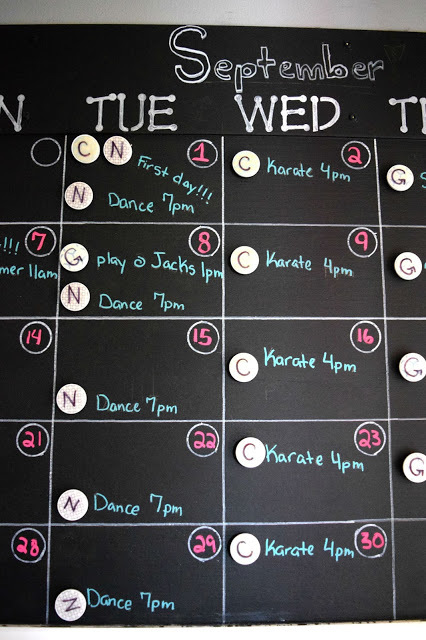 This way I can erase to my organizing hearts content with our activities and not have to worry about needing to redo the calendar. It is so pretty and not cluttered with “stuff” yet. 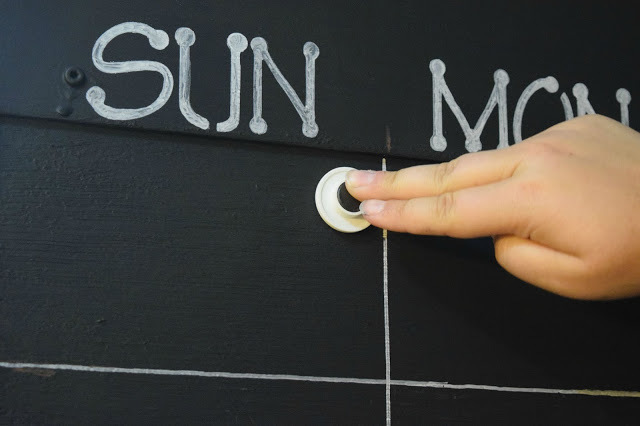 One of the magnet clips works as a great circle shape, set it upside down on the calendar. Then I traced around it. 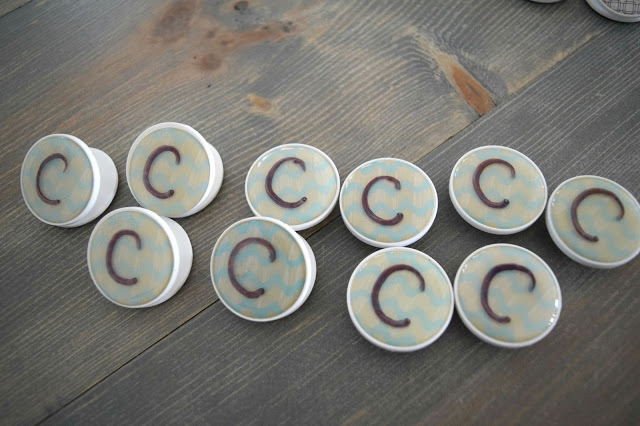 These circles will be where I write in the date of the week. I am going to use chalk or washable chalk markers to fill this out each month. Chalkboard colored pencils were what I had planned to have on hand and use, which work fine. They are not messy or chalky. But, I wanted something that could pop. After filling out this command center with our schedule, all of the light pencil colors get lost in the shuffle. 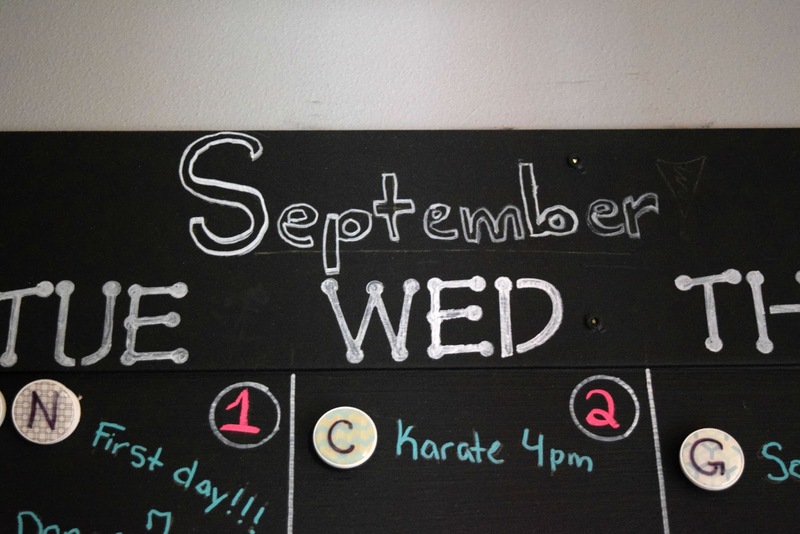 I purchased some new washable chalk markers to put in the dates as well as the monthly activities. 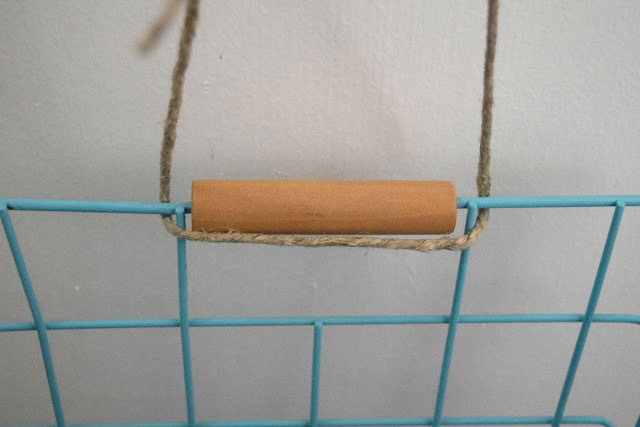 I would love to share a link to what I used, but they were on sale at Michael’s crafts store and I cannot find them online anywhere. I do not want to link to something I have not used. 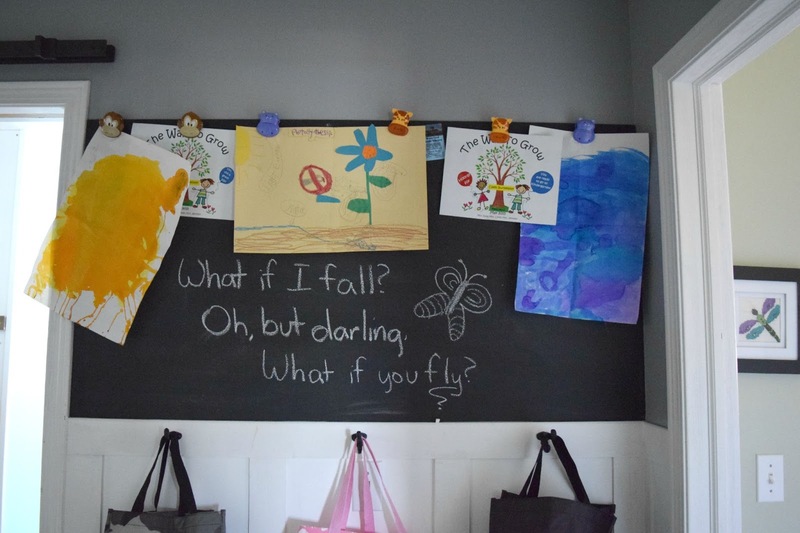 But, know that there are washable chalkboard markers out there. The ones I have are not messy, they do not have a odor and they are bright and colorful. The thing that makes this command center work so well is that I utilized the magnets and the markers. With each child’s designated magnet, I set it in the square where their activity is. Then i write what it is and any details. This allow me to save some time, space, and makes it fun for the kids to see “their” magnets being used. 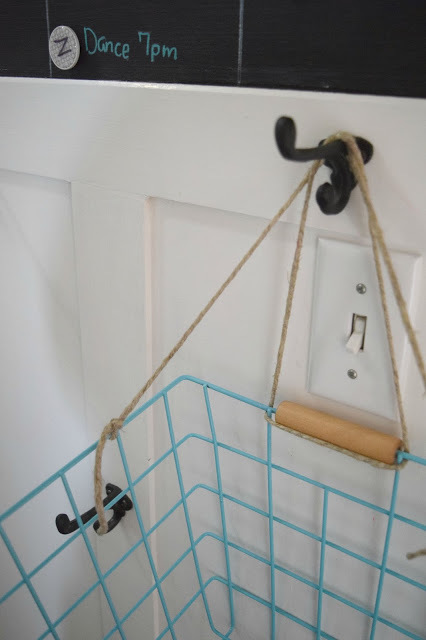 The next part for this command center is the baskets. 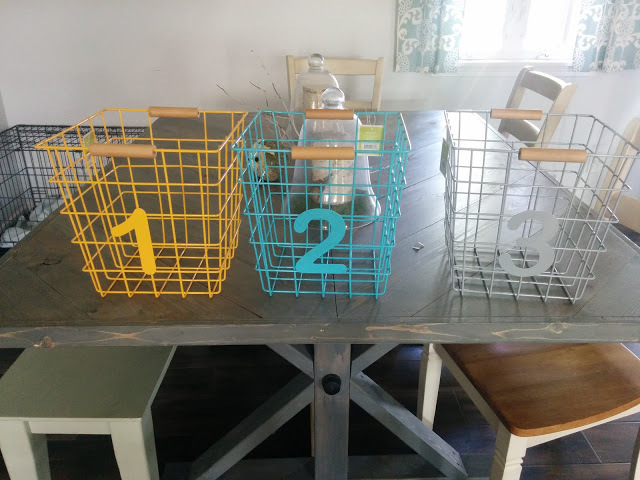 These baskets I purchased from Target, you can get them here. (This is a affiliate link). I fell in love with these and knew I had to use them. I did not want to set them on the ground though. Let’s face it, they would have been kicked over or commandeered to become a doll house or other toy with my kids. They would not have lasted very long. I need to bring them up, off the ground and attached to the wall. More permanent. Using some twine, I cut a fair amount off of the roll. Looped it through the handle in the back of the basket. Making sure both ends had even twine. 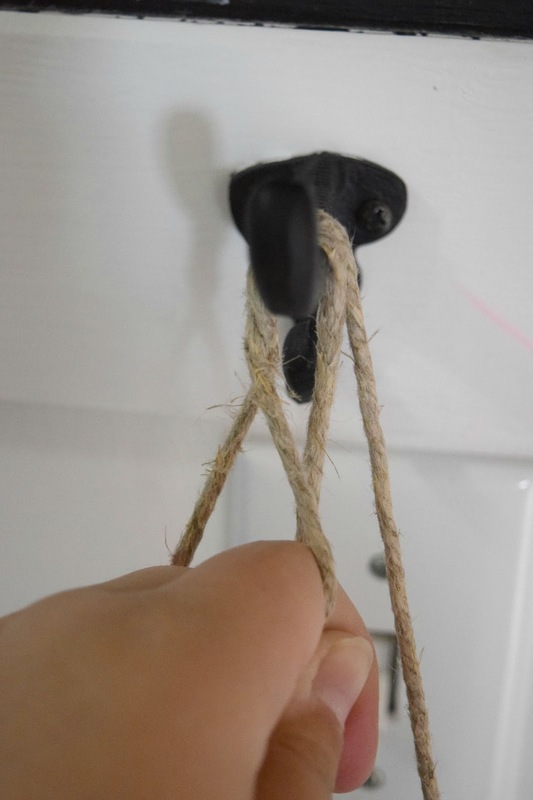 I twisted and tied the twine around the hook. I figured I had these hooks already there, I should put them to use. Like I said, there is no space that is not used in this home. Then pull each end to the center of the basket and tie a knot through the basket itself. I created a wonky triangle. It did the trick, got the baskets in the air, hold them in place, and the rope is not in the way of getting things in and out of the basket. I am all for things looking pretty, but they need to function. It is just not going to work any other way. As you can see, my kid’s dance, Karate and soccer gear fits nicely inside it. This basket in particular is currently stuffed with knee and elbow pads, a helmet and skateboard gloves. 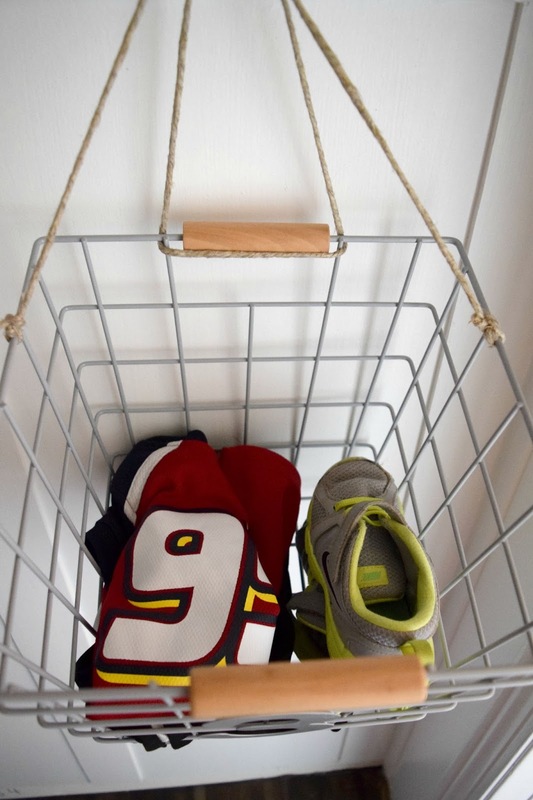 This is Gavin’s basket and it is a wild, un-organized hodge-podge, just like my wild child. These baskets grabbed my attention and my heart in the housewares aisle at Target. They are everything I dreamed they would be and more. It is decorating fate that they were created, I found them, and they are exactly the same number of children I have. Decorating fate I tell you! The big guy upstairs is looking out for me. When I say that, I obviously mean the big shots at Target who are probably sitting in their high rise office when making these corporate decisions like what baskets to sell. That is it my friends! Other then the much needed painting prep this is a no fuss, and really simple family command center. A big space, lots of time, loads of money, or skills is not needed. Just some vertical space in your home and some paint! I store the magnets not in use in one corner of the calendar. I used the washable markers for the month name as well. So all of this is customization and able to be changed with each month and new activities added. As the way command centers should be. This hallway is done! I never planned to go all out in this space. I mean, who decorates their hallway? But, this hallway is a big L shape that is in the center of our home. I walk down it so much during the day. It is so bright and cheery now. I adore that even one tiny end of this hallway has now turned from a general walk through space into a functional command center. The tiny space packs a big punch. “Mama said knock you out!” I kicked command center booty. 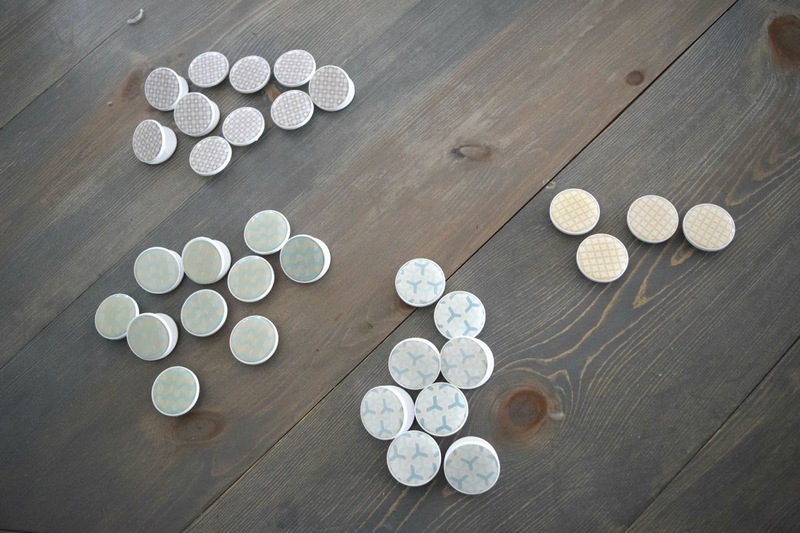 If you are new to my blog, this project is exactly the kind of thing I like to share. I am working on making this house work for us. Use every space, enjoy it all. I am also wanting to make it feel pretty and happy. My life and family are bright and loud. Our home needs to reflect that. Lastly, I really try to cut corners and not spend a lot of money. What was once a financial necessity for my family has now become a personal challenge. I like to push the boundaries on what you can do, without spending a lot or needing some crazy building skills. I think I proved my point in my painting mess mistakes. I am far from professional. I only claim to be a professional human, woman more specifically. 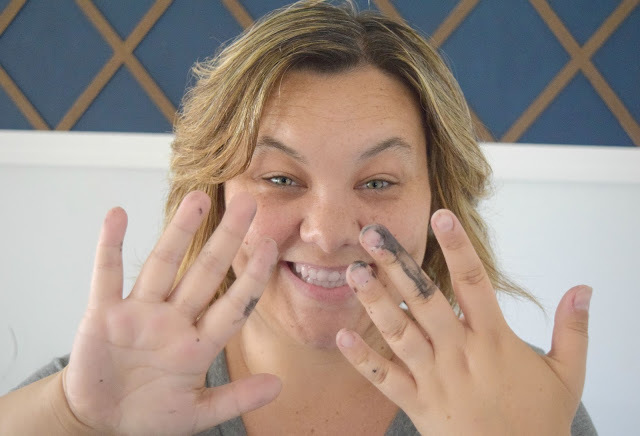 Motherhood, decorating, blogging, painting… it all is a work in progress. 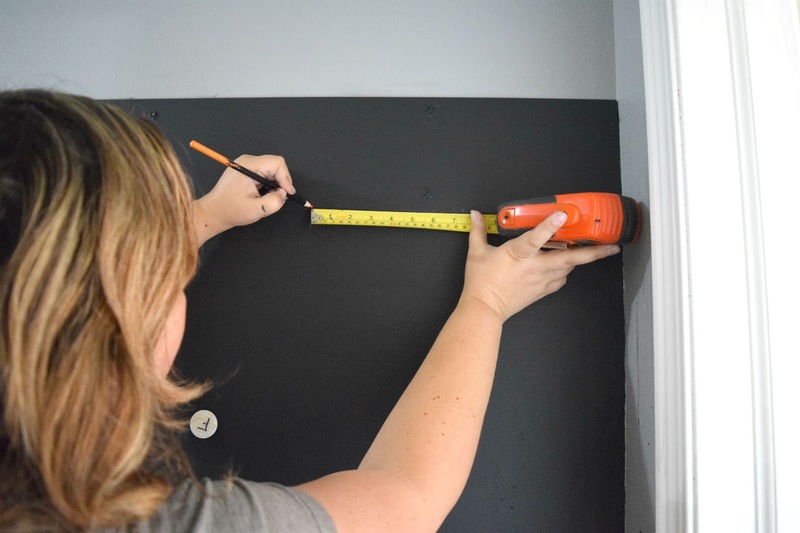 Have you ever gotten too sure of yourself and made a big mistake when working on a project for your home? How do you keep your families schedule organized? 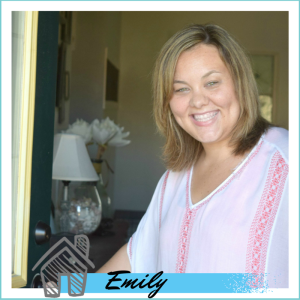 Emily! 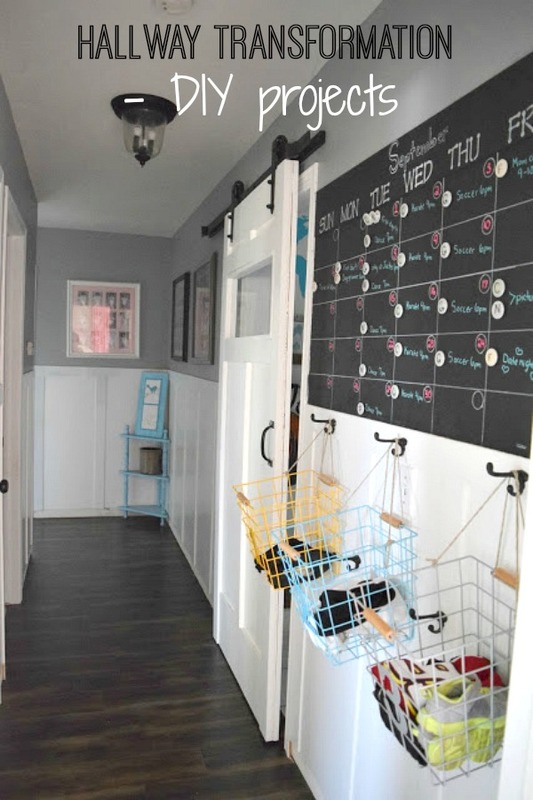 I love, love your command center and those baskets are adorable. Girl, you are truly talented and creative. I enjoy seeing what you will come up with next!!! Pinned & Stumbled!!! Thank you so much Kim! Your kind words made my day, I am so happy you enjoy my ideas! I absolutely love this! I have had a whole Pinterest board fall of command centers for a few months now. So far all it has turned into is a letter rack from Amazon that is stuffed with bills and that I hang my keys on the bottom of. You have totally inspired me to get off my tail and make it something better! You have to start somewhere with a command center, and having a ton of ideas and a designated place for it is the beginning. Good luck in the making of your command center! I absolutely love this! You have inspired me to up my game and revamp our command center. We are no where this organized. Wohoo! I am so happy I inspired you, good luck on your revamp! WOW I love this! Pinned!! I adore this space! I have a place in my home office that I think will be perfect for this. I will be using your post as inspiration. Thank you for sharing in detail! I am so happy you like this tutorial. That is great you have a place where something like this can go, it is a life saver for us! Ha ha, I would love to come and decorate your house! Although I think your home is beautiful Christine! You are SO creative! I'm obsessed over this. I only have a baby right now, but once my little one(s) get older I will definitely be needing this. Our life is already crazy. I love that quote too. So sweet! Thank you! 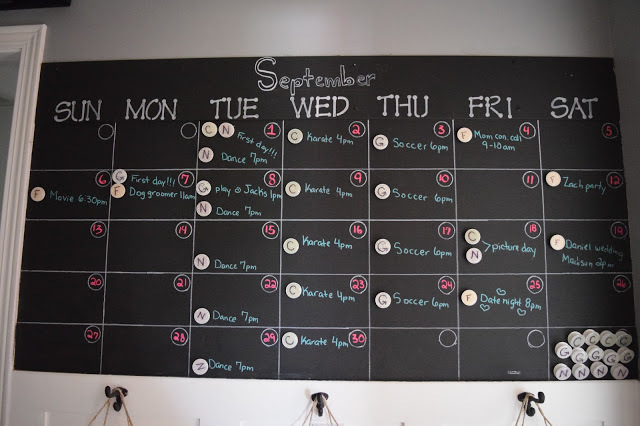 Having something in place like this for then the chaos of a family schedule becomes very real is a good idea. This was so simple to make. 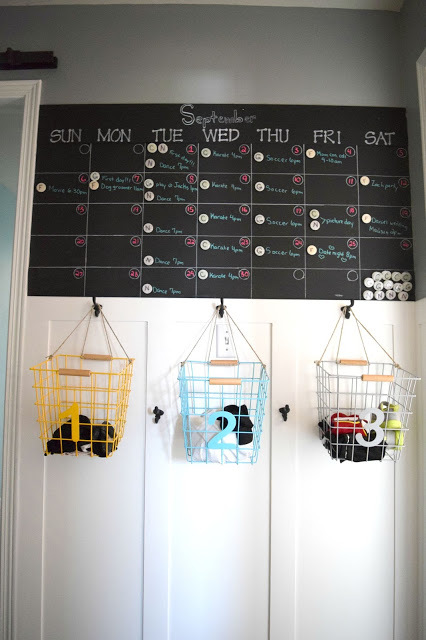 I love the calendar wall and NEED to have one in my home now! 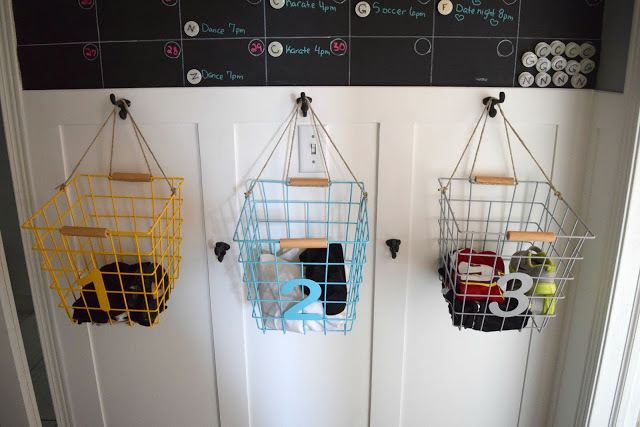 What a great way to stay organized!! Pinning! The calendar is really amazing and has helped us streamline our schedule and stay on top of things so much more. What a great command center! I saw the photo last week and loved it instantly, I'm glad to see the process. I enjoyed the moment where you were so sure about being able to paint without the cover up that you messed it up and had to repaint the white. I used to do that when I was a makeup artist and forgot to protect the undereye before doing a smoky eyeshadow. I have to keep it real, and show that I messed up. 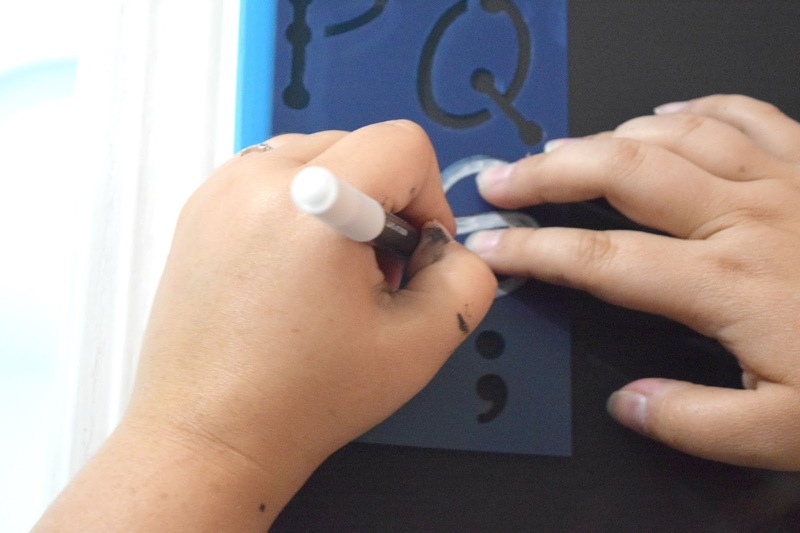 It is also a great reminder to others to prep your paint area. I am so happy you enjoyed this command center! Great job, it looks awesome! I love that you share the mistakes you make along the way. but compared to a lot of us you are VERY professional!! Love what you did with this space. Thank you so much! I had to share my mistake, I am no where near perfect. This also is a great reminder to others to prep their space before they paint. Learn from my mistakes. Ugh, the kitchen counter is the forever catch all. My house still sometimes falls into that trap, I try to control it because we have a small kitchen. Any clutter is too much. I love reading your blog, you always have the best projects! Wish I would have seen this when my kids were younger. This is so great! Such a great tutorial too. We NEED a command center! Thank you April! 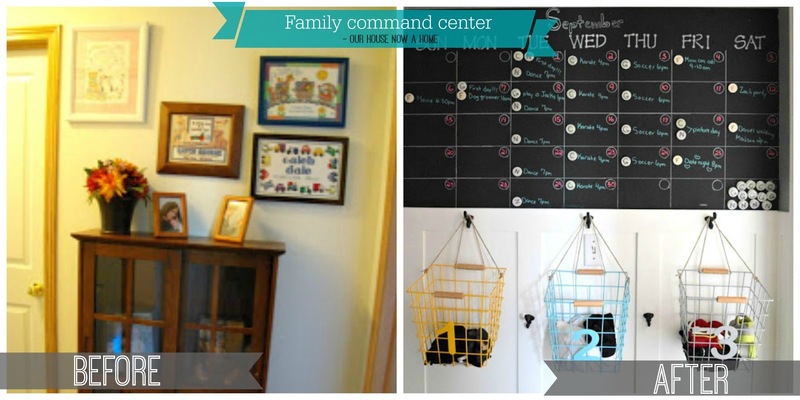 A command center is something I think any family could use. With your crazy good skills in home decorating and creating things I am sure your command center will be amazing! Thank you! This was a process of finding what would work best for us, I finally figured it out. I am a big fan of wainscoting too! Everyone looked at my weird when I said I was going to put it in the whole hallway, I stuck to my idea and am so happy I did! 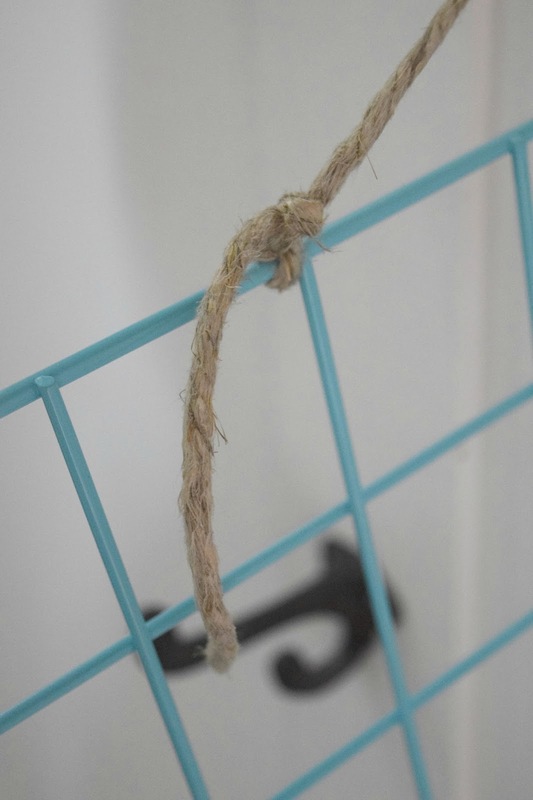 I got plastic wall things from IKEA that are much less cute than your baskets but are serving the same purpose. i don't have space to do it like i want for all 7 kids though. As long as you have some baskets and they work to put stuff in that is all that matters. Wow, 7 kids, you are super woman! Love your command center. 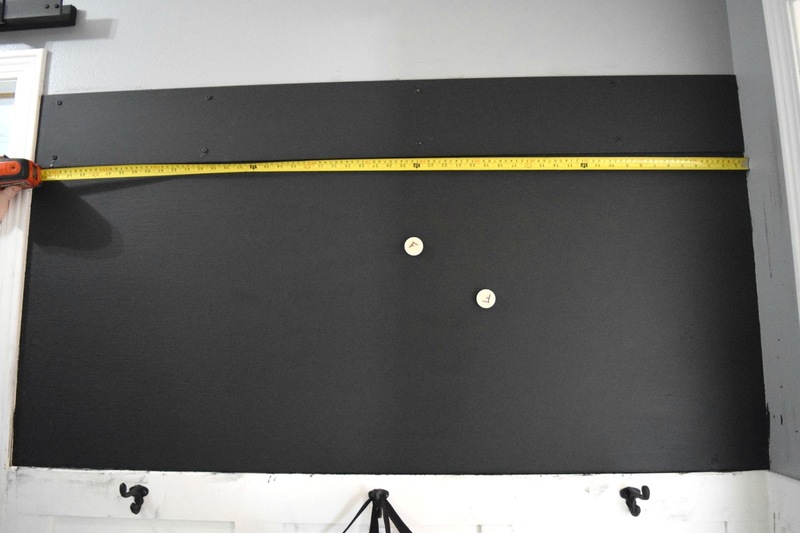 Also wondering where that black ceiling light is from…. This space came out so nicely, great job. I often struggle with feeling like a “pro-painter” myself, it rarely ends out well for me. 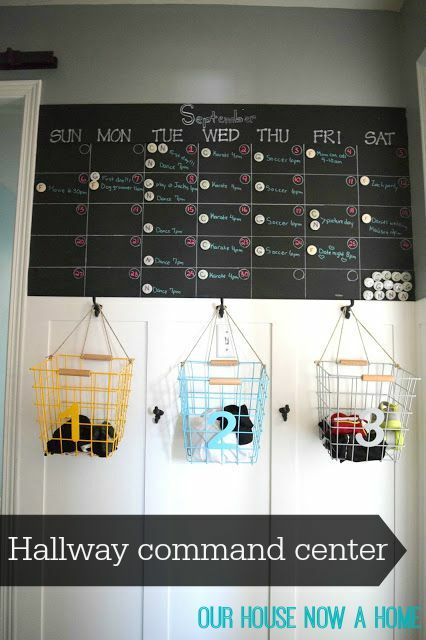 Staying organized when you have kids is so difficult, I would love to do something like this to keep everyone on time! I love the baskets, they add a great pop of color to the black and white area. This is incredible! I’m sure there are apps that can do something similar, but nothing beats a good old-fashioned real life board that you can SEE. This is really a creative thought. I just love it.